Rich Rinehart’s (a.k. AZooNY’s) RineStock Studios is an entity where high quality, soulfulness, and imagination are the guiding principles. Through RineStock Studios, Rich runs a music publishing company (Hear’s Some Tunes Records), a record label (Back2theBeat Music), and had an art directory but is now his alter ego (AZooNY.com), and an internet web page creation and hosting service. Besides of all this, he finds the time to write and record his musical creations. Rich is also a fanatic fan of Cleveland Ohio and supports the local arts scene whenever he can. In the 1990’s he crafted the original web presence for Cleveland Opera, the Cleveland Chamber Symphony, and the Ohio Independent Film Festival. He is currently President of the Cleveland Chamber Symphony and Board member (ex-Vice-President) of Verb Ballets. Photography is also one of his artistic outlets and you are encouraged to visit StudioB‘s photo gallery for a look see. On the recording side, Rich has Engineered and Produced a number of music CD’s. The first one, “Pictures At An Exhibition” was a classical piano compilation performed by Cleveland pianist Bob Perry. 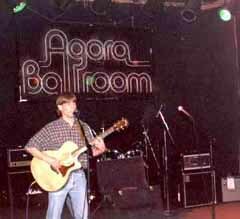 The second was an Alternative Rock production by the band Almost Huemon which contains 12 of Rich’s original song compositions. With an eye looking forward, Rich notes “I think one of the most important aspects of successful creativity, is just forcing yourself to see your project or idea through to completion”. Rich’s current CD release entitled “NUTS“, under his artist name AZooNY. On the artwork side Rich founded and runs AZooNY.com, an art and artist promotional site. Within the NASA Glenn Graphics and Visualization (GVIS) Lab he visualizes scientific data and helps to apply innovative technological solutions to scientific challenges. Studio C contains Rich’s symphonic compositions. In May of 2007, Verb Ballets danced to his symphony entitled Ocean Depths at the Cleveland Playhouse. In 2010 Verb first danced to his Cleveland Flats Symphony. Verb has continued to perform variations of the Flats piece, with the most recent performances in March 2013 at the Cleveland Public Theater (CPT). 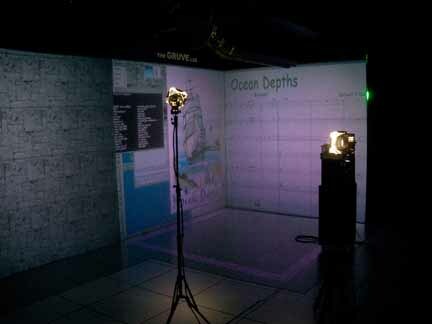 Ocean Depths score in NASA Glenn’s Virtual Reality CAVE (the GRUVE Lab). Be sure to check out his latest project, a comical theater piece entitled Mars Opera.